Alby's wedding cakes. The wedding flowers were white calla Lillis and huge amaryllis. The design around each cake was simple orange polka dots matching the ribbon and chair covers in the venue, The stands shown are available for hire from me. Just a note to say thank you for the beautiful wedding cake you made us for our wedding. Not only did the cake look amazing and matched with the theme of our day perfectly but it also tasted delicious too. we have had a lot of compliments from our guests on your fabulous cake and we are so pleased that Catrin recommended you to us. with kind thanks and best wishes from Rachel and Daniel. The box tiered wedding cake seems to be back in fashion again, and does allow designers some room for fun and experiment. 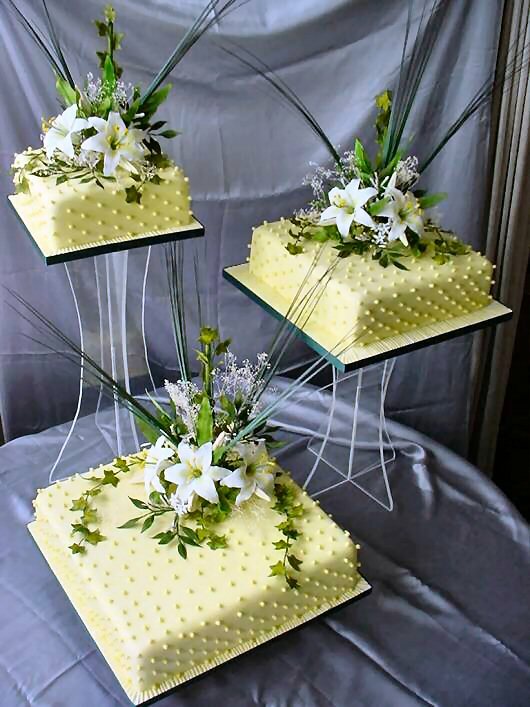 This cake for Janette was a mix of the classic flower arrangement and boxes, and went well with their colour theme. Sponge chocolate and lemon sat on top of the traditional fruit cake. Dear Franziska, Just wanted to thank you for our beautiful wedding cake yesterday. We had many compliments on it and it looked stunning. As soon as we get a reasonable looking photo ready we will email it to you, but this will probably be in the New Year as we will be going on honeymoon shortly. Thanks again have a wonderful Christmas and best wishes for the New Year. Judy & Tony Life. 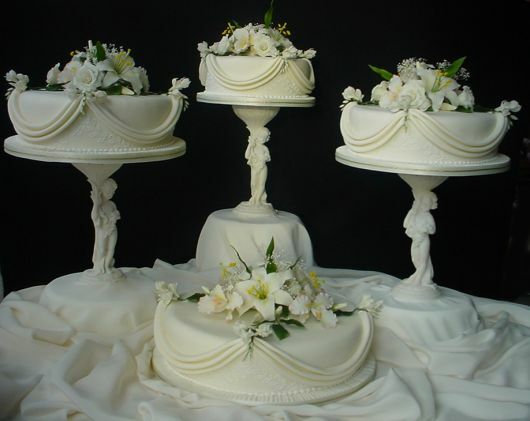 The Marita wedding cake was designed for a Medieval banquet in Wales. Franziska used the Binding twig weave to give the rustic effect, and enhanced this further with the inclusion of wild forest fruits. Orchids and Fuchsias wound with Ivy completed the look. Beads added a touch of glamour. 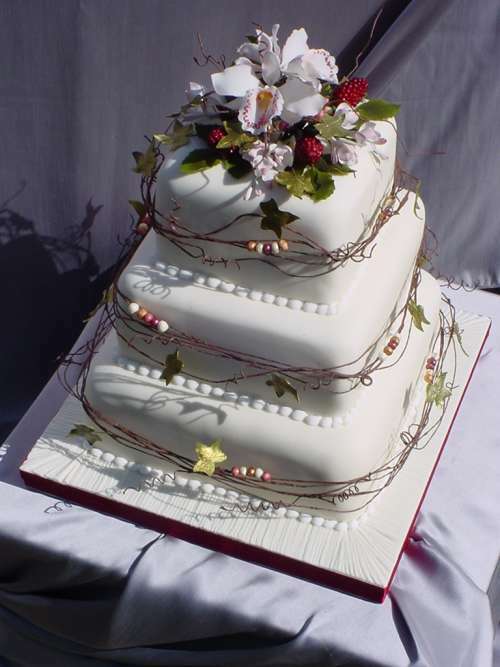 The wedding cake was a three tier fruit cake. 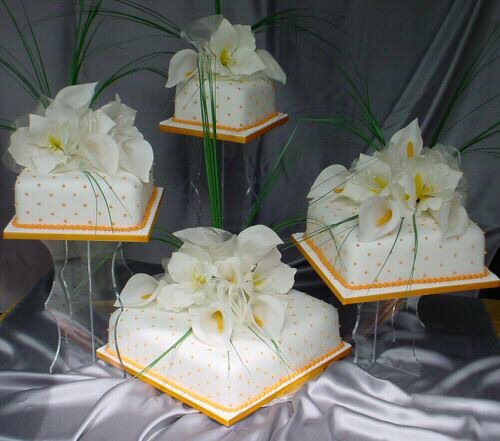 The Athena Wedding cake has a voluptuous bouquet of sugar lilies, on a circle of long leaves on top of each cake. 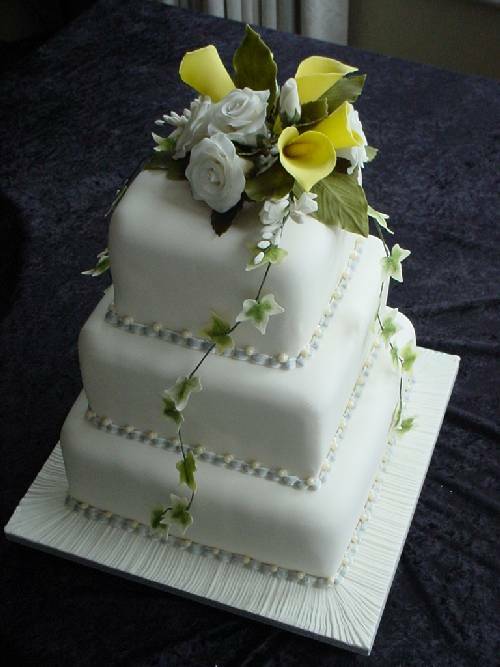 This wedding cake is very popular with summer weddings. 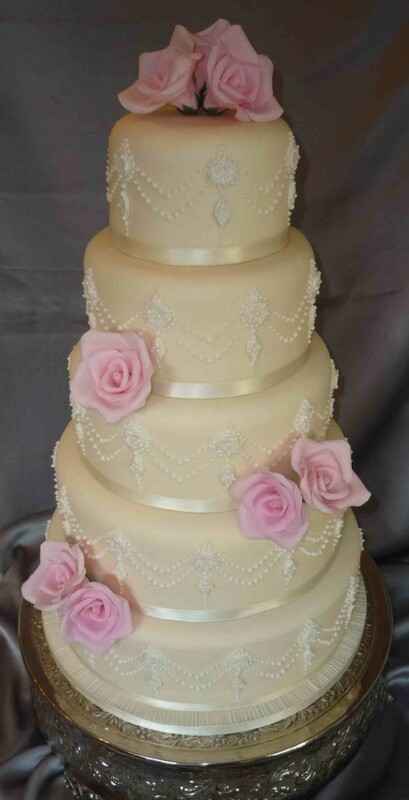 The piped design around each cake was taken from the beading of the brides dress. You may want to take the design from your own wedding gown. The lilac ribbon around each cake board can be changed to whatever you wish. The Nuru cake was designed with the idea of making an ordinary stacked cake a little taller. 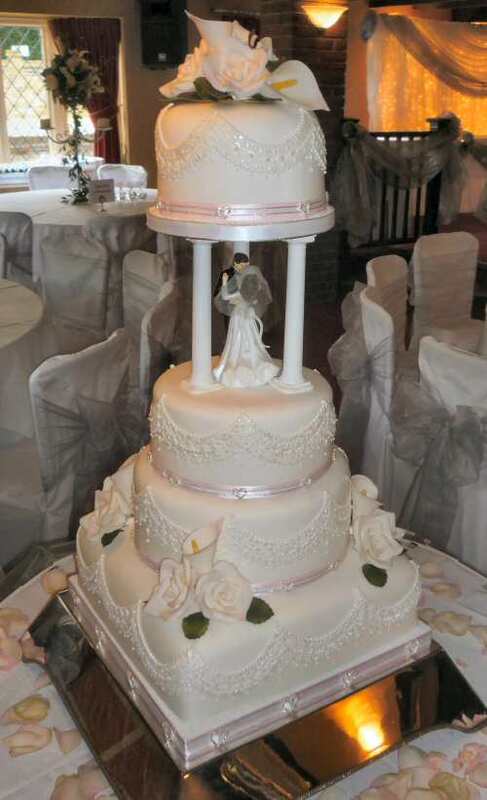 The separators between each cake were 45mm in height, therefore making a 3 tier cake taller than a 4 tier. 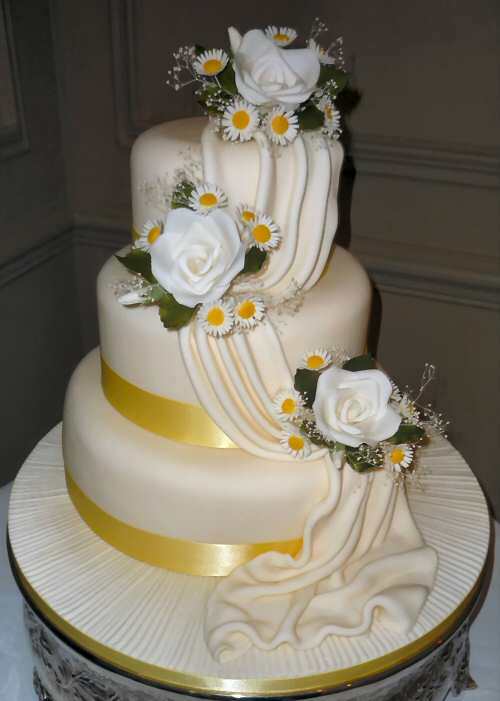 The delicate floral piping design around two of the cakes was enhanced by the addition of sugar rose buds, giving the design more of a bas-relief effect. The wedding flowers were white and lilac sugar roses. 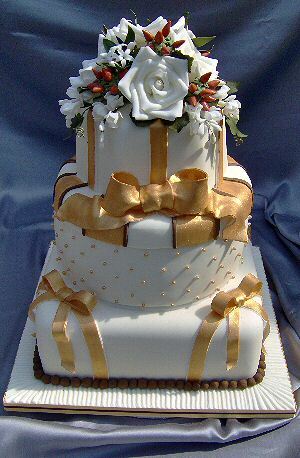 This wedding cake will look beautiful with any type of sugar flowers and ribbon to match the flower or venue colour scheme. 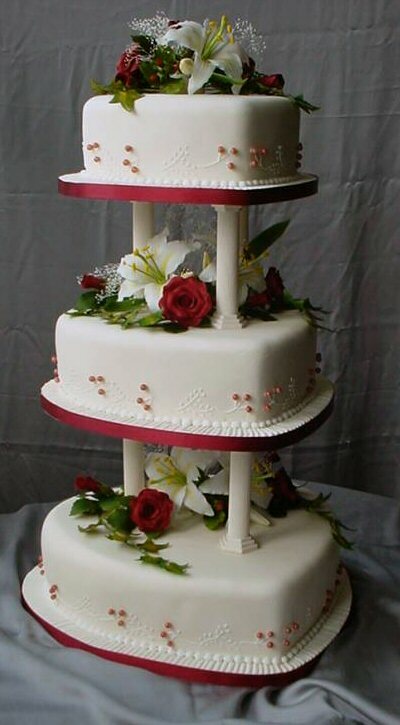 If you plan to have your cake in the middle of a room at your wedding venue , to be seen from all sides, the Rimma cake is one such design to consider; there is a bouquet of flowers on each side. No crisis about which way to point your cakes! 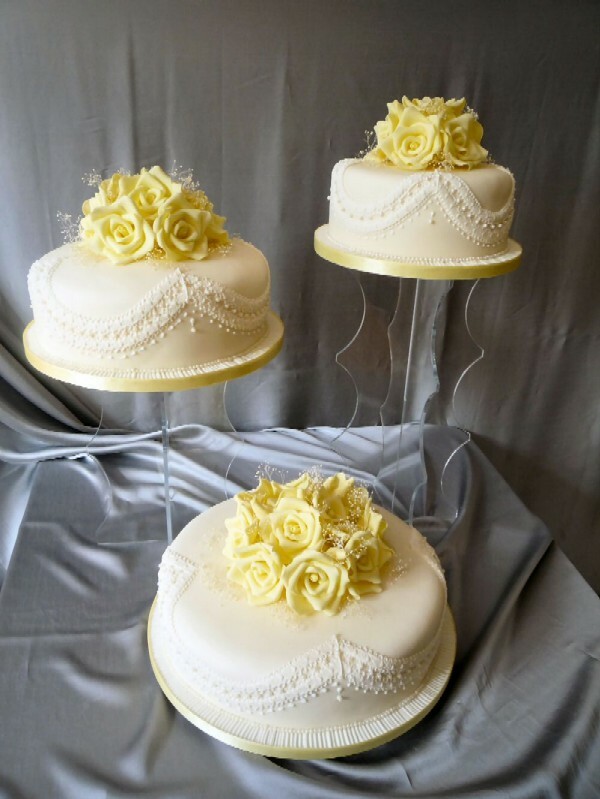 If your cake is positioned in a corner or one side is against a wall, please let me know so that I can position the flowers to wards the front of the cake. 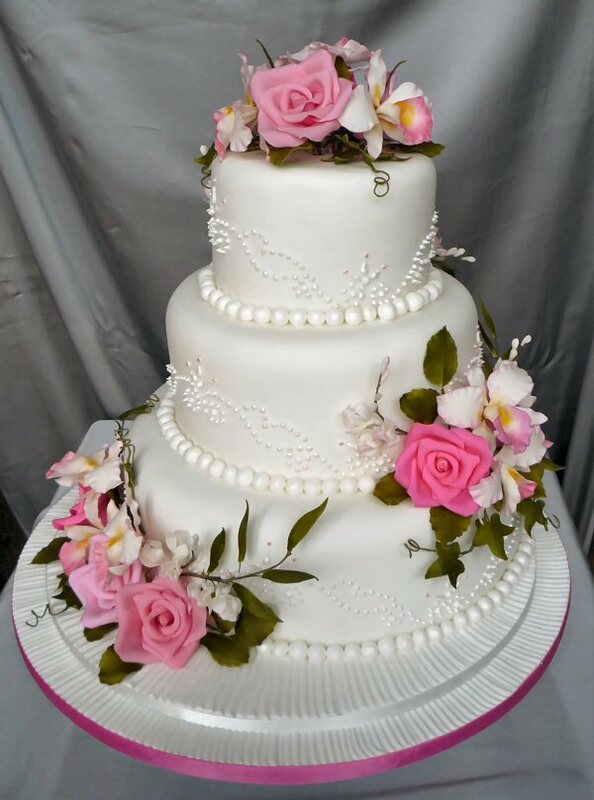 The Rimma cake has different shades of pink sugar roses, white Orchids with pink centres, white freesias with delicate pink edging and light green foliage. The piping is coloured with white pearlescent food colour, to make the piping stand out more against the white icing. Thank you yet again Franziska for excelling all our expectations with Abigail and Alistair's wedding cake very best wishes for the future. 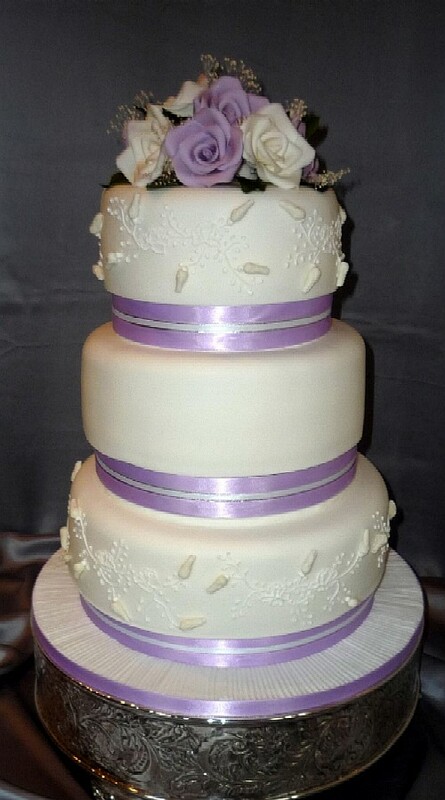 £450 3tier 10” 8”& 6"
Angela wanted to have a cake that was unique and bold. Burgundy and Ivory always look spectacular together. The burgundy drape on the middle cake matched the grooms cravat. 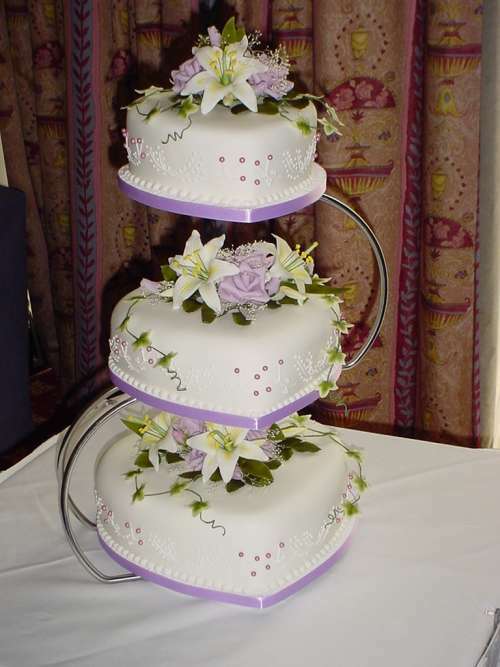 This cake can be displayed on any cake stand and made in as many tiers as you like. It can also be made in different colours, just ask if your colour is available. 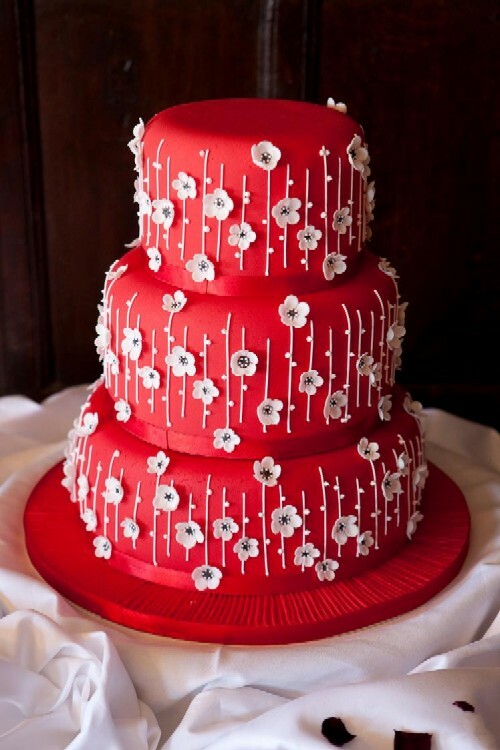 The perfect cake for a white wedding? This is possibly my most asked after wedding cake. A mixture of sugar roses and calla lilies on a cascading drape. 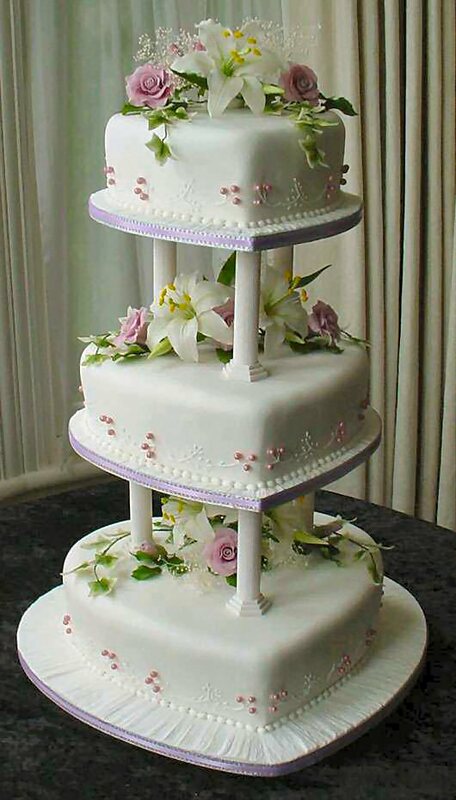 This cake can be made as a three or four tier wedding cake. 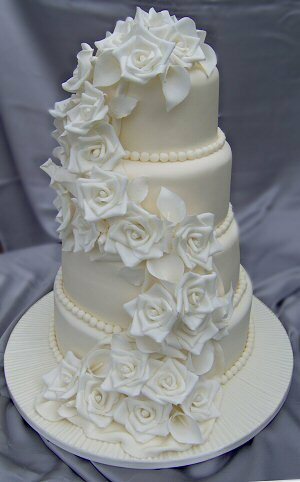 The ivory icing sets off the white flowers. (They of course can be any colour!) Remember that sponge cakes with Butter cream at the height of summer in this style of cake no matter how strong the supporting dowels are, are not always the wisest choice. However there are many different ways of overcoming this problem - Ask me! Thank you so much for the beautiful cake, it was perfect! 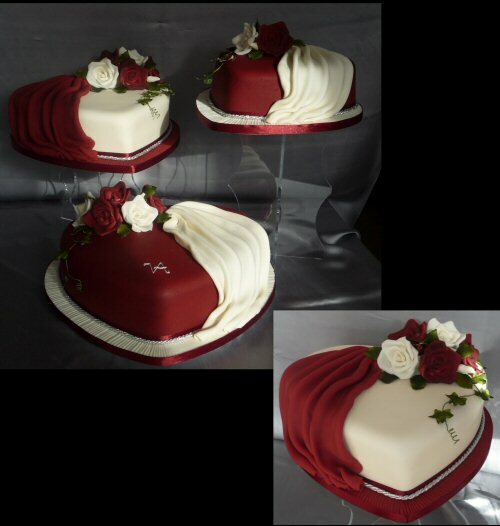 A heart shaped wedding cake design, very popular with those who like to have 3 separate cakes. 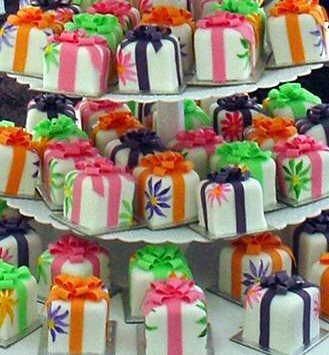 It can be created with colours of your choice and the sugar flowers to suite your occasion. 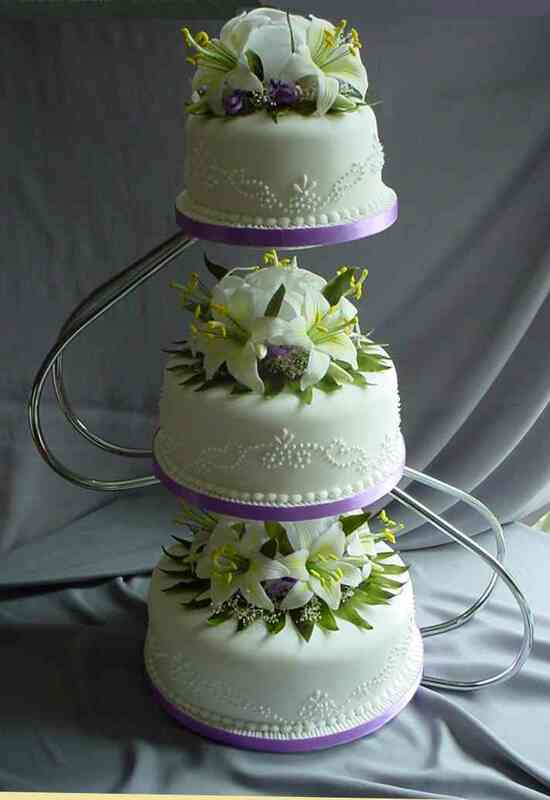 Unlike many other similar cake stands, this one has enough space between each layer to show off each beautiful bouquet. The stand is included in the price; I just require a refundable deposit so that the stand is safely returned to me. Thank you so much for the pictures I am so pleased with them as I did not have a good photo from the photographer you have made my day thank you so so much. I think the cake turned out spectacular thanks to all your hard work. Make sure you put it on your website!! the top tier has pride of place in my glass cabinet in the kitchen. 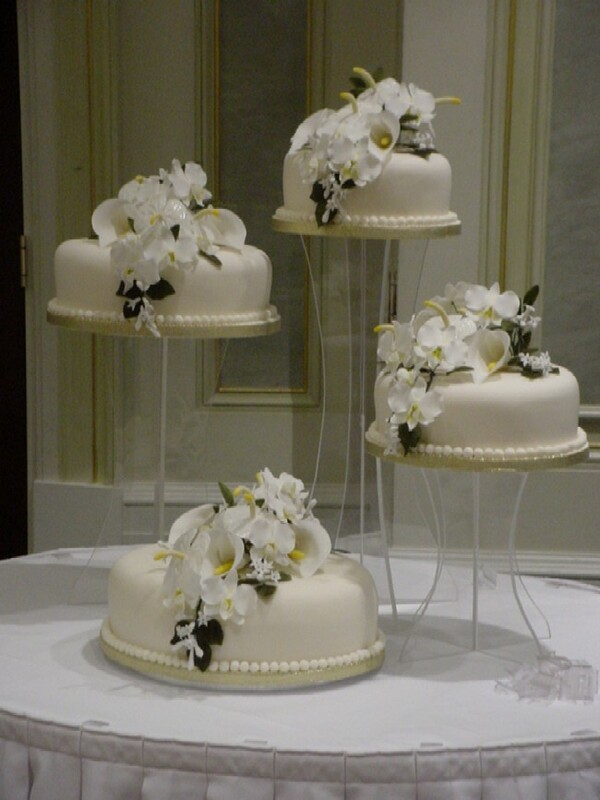 This beautiful wedding cake display was made with oval shaped cakes and trailing bouquets on each tier. The sugar flower bouquet is made with white anthuriums, calla lilies, Singapore orchids, phalanopsis orchids, Stephanotis, small long leaves and gypsophelia. I just want to say 'THANK YOU' for the beautiful cake, it looked and tasted amazing. Everyone thought the cake was absolutely stunning and it look perfect on the stand - very grand!!! It has been lovely working with you and if anyone needs a wedding cake or a cake for any other occasion, I know who to refer them to. If you like this design, let me base a quote on it for your wedding cake!